The recent crackdown in Egypt has presented the US with a recurring problem: how does it respond when an allied regime commits large-scale, public human rights abuses? Ostensibly, the current debate in Washington is over whether to suspend $1.3 billion in military aid to the Egyptian army. However, the US faces an underlying dilemma over the most effective way to create the stable Egypt necessary for its national security interests — should Washington de-emphasize democracy promotion in Egypt as a policy goal, or push it to the foreground? A stable and friendly Egypt is vital to Washington. Egypt provides overflight rights which allow American aircraft to take the most expedient routes on missions to Afghanistan and throughout the Middle East, and it gives priority to US warships and aircraft carriers for transit through the Suez Canal. Egypt provides a counterweight to Iranian influence in the region, and helps shore up Israel’s strategic position, through its enforcement of the siege of Gaza and cooperation against militants in the Sinai Peninsula. Faced with these facts, the Obama administration has de-emphasized democratization as a US goal and pursued its default policy of preserving relations with the dominant political force: previously President Hosni Mubarak, then President Mohamed Morsi, and now the military regime. Recent actions such as the cancellation of an annual joint military exercise and a delivery of helicopters, and a review of non-military aid, are largely symbolic and do not constitute the level of pressure required to alter the regime’s political calculations. Washington’s policy is a gamble — it is betting that the military can ensure stability in the short-term, if outside pressure to resume democratic processes is postponed to some, yet-to-be-determined future date. However, demands for a total suspension of military aid are growing in Congress and think-tanks, and from those who believe such a move can be used as leverage to push for the resumption of democratic reforms. Among those pressing the idea is the Working Group on Egypt, an alliance of neo-conservatives, liberals, human rights activists, former George W. Bush and Obama officials from democracy promotion, and think-tanks such as Freedom House and the Foundation for Defense of Democracies. Robert Kagan, formerly of the Project for a New American Century and now of the Brookings Institute, chairs the Working Group alongside Michele Dunne, a former National Security Council and State Department official who now works for the Atlantic Council. While moral rhetoric certainly plays a role in the Working Group’s pitch, the idea that a transition to democracy is “the only way to achieve stability” runs through its public statements. The Group’s fear is that barring a significant sector of Egypt’s population from politics will lead to radicalization and increased instability. In its most recent statement on August 15 — a day after Wednesday’s bloodshed — the Working Group called for a suspension of aid, arguing that continued military rule poses “a direct threat to regional stability and U.S. interests”. While there is no immediate danger that Islamist groups, radicalized by the current repression, will attempt to seize power in Egypt, there is a growing possibility of a domestic insurgency, possibly supported by transnational Islamist networks, which could further destabilize the Middle East. The Working Group argues that, by pressurizing the Egyptian government to return to an inclusive democratic process, Washington could halt this radicalization by providing non-violent avenues for dissent, leading to a more stable political situation. However, while pressure for a suspension of military aid in also growing in Congress, the administration fears that such a move would dissipate any remaining US influence within Egypt and so will strongly resist such a course of action. Even if Washington did halt military aid, such a move may not have any immediate impact on the Egyptian regime. True, the military would lose out on the advice and some of the technology which it gains through links with the US, but it could conceivably turn to other donors such as the Gulf States to replace the dollar amount. 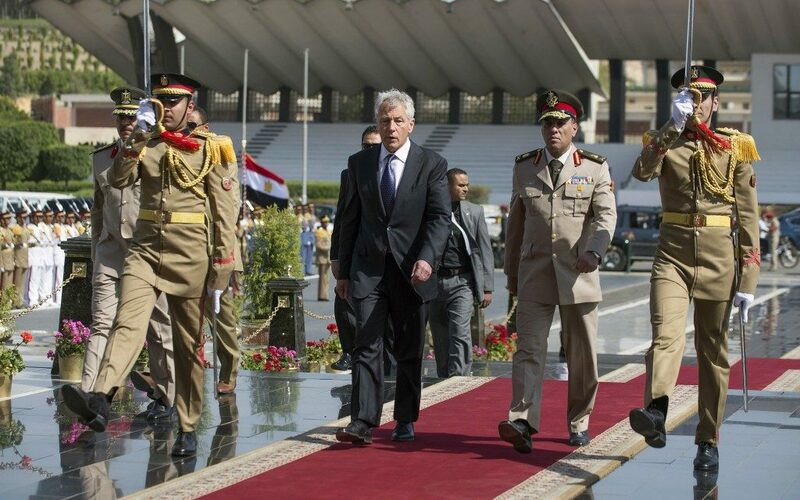 Unless Congress unites to pull the plug — and in the absence of a credible political force within Egypt which is independent of the regime, democratic, and compatible with US interests — the administration will attempt to maintain relations with the military and interim Government while deploying incremental measures, gambling that military rule will produce stability. This policy of pursuing short-term stability rather than a more long-term strategy has led to a decline in US influence in Egypt since 2011, but it will probably not be reversed soon.